0	0	Change Your Words, Change Your Life	In Stock - Order before 4pm for same day dispatchWant it on Wednesday 24 April? Learn Joyces' practical guide to speaking positive power over yourself and those around you. Her 'Smart Talk' theory will help you to put into practice the foundations to transform your life through the words you speak. Want to bring great good and positivity to your life? In this, another of her highly effective guides to Christian life, Joyce Meyer teaches readers the power of the tongue. You can increase your daily joy, uplift people around you and have a positive effect on your future all by choosing the right words. Her key message - the tongue is a powerful instrument for change. In her typical, upbeat and proactive style, Joyce encourages and motivates you to realise God's promises in your life. This book is a wake-up call that echoes the words of the biblical letter writer, James, by highlighting the power of words and the importance of harnessing this power for positive outcomes and avoiding negativity. In this book you'll be encouraged and empowered to speak words into your own heart that will change your life and the lives of those around you. This is all about discovering 'the power of a positive tongue' – you have the tool to change your life just by the way you speak to yourself and about yourself. Then you can move on to changing your world by the way you speak to others. Joyce Meyer sets out to give you the skills to use your most powerful instrument for your own good and the good of those around you. Make each word you speak carry the power to change your life. Change Your Words, Change Your Life by Joyce Meyer was published by Hodder & Stoughton in March 2015 and is our 11430th best seller. The ISBN for Change Your Words, Change Your Life is 9781444745214. 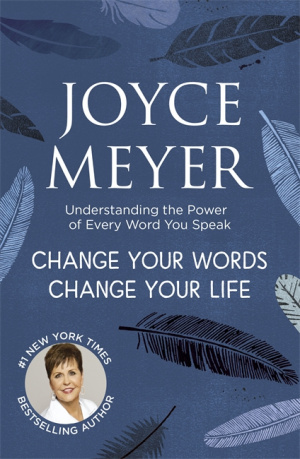 Another of Joyce Meyer's thoughtful, accessible and thoroughly Biblical expositions, this time on the subject of the words we choose to speak and the power they have to influence our own lives and the lives of others. She freely admits that this is an area in which she herself has had many struggles and she shares her triumphs and disasters and the lessons she has learnt along the way. Using a series of Bible passages that many people usually gloss over, she demonstrates the many warnings God has given us about careless talk and its inward and outward consequences. Words are like seeds – good seed gives a good harvest and bad seed a bad harvest. As always there is no quick-fix; just solid encouragement to align ourselves with God's will for us and wait in faith for the results. "Every day when we leave our homes we are going into a society that is drowning in tragedy. God has given us... words and if we use them properly they can be life changing." Got a question? No problem! Just click here to ask us about Change Your Words, Change Your Life. Building on the premises of 'POWER THOUGHTS' and 'LIVING BEYOND YOUR FEELINGS', Joyce now considers the tremendous power of words. Here she provides a series of guidelines for making sure that our talk is constructive, healthy, healing and used to good effect. In a 'Dictionary of God's Word' at the end of the book, Joyce provides dozens of scripture verses that she recommends reading out loud as one way of using and claiming healing words. 5. What Do You Want in the Future? 8. How Happy Do You Want to Be? 17. Do You Really Have to Give Your Opinion? 22. Do You Want to Change Your Life? Joyce: 'I have a very simple question to ask you: do you really want your life to change? Well I'm sure most of you would answer 'yes' but do your words tell a different story? Joyce is one of the world's leading practical Bible teachers, with her TV and radio broadcast, Enjoying Everyday Life, airing on nearly 450 television networks and 400 radio stations worldwide, including ABC Family Channel, Trinity Broadcast Network, Daystar, and the Word Network. Her bestselling books include 'Living Beyond Your Feelings,' 'Power Thoughts,' 'Battlefield of the Mind,' 'Look Great, Feel Great,' 'The Confident Woman,' 'I Dare You,' and 'Never Give Up!' Joyce holds conferences approximately 15 times each year, worldwide, speaking to thousands.